An elevator is moving downward when someone presses the emergency stop button. The elevator comes to rest a short time later. Give the signs for the velocity and the acceleration of the elevator after the button has been pressed but before the elevator has stopped. A child throws a baseball directly upward. What are the signs of the velocity and acceleration of the ball immediately after the ball leaves the child’s hand? A child throws a baseball directly upward. What are the signs of the velocity and acceleration of the ball at the very top of the ball’s motion (i.e., the point of maximum height)? Velocity differs from speed in that velocity indicates a particle’s __________ of motion. Unlike speed, velocity is a __________ quantity. A vector has, by definition, both __________ and direction. Once you have selected a coordinate system, you can express a two-dimensional vector using a pair of quantities known collectively as __________. Speed differs from velocity in the same way that __________ differs from displacement. Consider a physical situation in which a particle moves from point A to point B. This process is described from two coordinate systems that are identical except that they have different origins. The __________ of the particle at point A differ(s) as expressed in one coordinate system compared to the other, but the __________ from A to B is/are the same as expressed in both coordinate systems. The student drops one cannonball, and exactly 1.0 s later drops the other cannonball from the same height. What is the time interval between the first cannonball striking the ground and the second cannonball striking the ground? The student drops one cannonball, and after it has fallen exactly 1.0 m drops the other cannonball from the same initial height. What is the distance between the cannonballs when the first cannonball strikes the ground? The student throws one cannonball directly upward at 5.0 m/s and simultaneously throws the other cannonball directly downward at 5.0 m/s. d. The object will slow down, momentarily stopping, then pick up speed moving to the left. At time t=0 an object is traveling to the right along the +x axis at a speed of 10.0 m/s with acceleration -2.0 m/s^2. Which statement is true? a. The object will continue to move to the right, slowing down but never coming to a complete stop. b. The object cannot have a negative acceleration and be moving to the right. c. The object will slow down, eventually coming to a complete stop. A ball is thrown straight up. What are the velocity and acceleration of the ball at the highest point in its path? You drop a rock off a bridge. When the rock has fallen 4 m, you drop a second rock. As the two rocks continue to fall, what happens to their velocities? a. The velocity of the 1st rock increases faster than the velocity of the second. d. Both increase at the same rate. You drive 4 km at 30 km/h and then another 4 km at 50 km/h. What is your average speed for the whole 8-km trip? d. The acceleration of both balls is the same. a. The acceleration of the dropped ball is greater. b. The acceleration changes during the motion, so you can’t predict the exact value when the 2 balls pass each other. c. The accelerations are in opposite directions. A ball is thrown downward at a speed of 20 m/s. Choosing the +y axis pointing up and neglecting air resistance, which equation(s) could be used to solve for other variables? The acceleration due to gravity is g = 9.8 m/s2 downward. Check all that apply. b. Align the hypotenuse of a right triangle with the vector and an adjacent side along a coordinate direction with ? as the included angle. Choose the correct procedure for determining the components of a vector in a given coordinate system from the following list. a. Align the adjacent side of a right triangle with the vector and the hypotenuse along a coordinate direction with ? as the included angle. c. Align the opposite side of a right triangle with the vector and the hypotenuse along a coordinate direction with ? as the included angle. You are adding vectors of length 20 and 40 units. Which of the following choices is a possible resultant magnitude? A baseball player hits a ball that soars high into the air. After the ball has left the bat, and while it is traveling upward, what is the direction of acceleration. One ball is dropped vertically from a window. At the same instant, a second ball is thrown horizontally from the same window. Which ball has the greater speed at ground level? d. It depends on how hard the ball was thrown. 3 kicks that land at varying distances but reach the same maximum height are all in the air for the same amount of time. a. The bullet will hit the monkey because both the monkey and the bullet are falling downward at the same rate due to gravity. A hunter is aiming horizontally at a monkey who is sitting in a tree. The monkey is so terrified when it sees the gun that it falls off the tree. At that very instant, the hunter pulls the trigger. What will happen? b. The bullet will miss the monkey because the monkey falls down while the bullet speeds straightforward. c. It depends on how far the hunter is from the monkey. d. The bullet will miss the monkey because although both the monkey and the bullet are falling downward due to gravity, the monkey is falling faster. Which statements are not valid for a projectile? Take up as positive. Check all that apply. a. The projectile has the same x velocity at any point on its path. b. The acceleration of the projectile is positive and decreasing when the projectile is moving upwards, zero at the top, and increasingly negative as the projectile descends. c. The acceleration of the projectile is a constant negative value. d. The y component of the velocity of the projectile is zero at the highest point of the projectile’s path. e. The velocity at the highest point is zero. a. The net force acting on it is zero. An object cannot remain at rest unless which of the following holds? b. The net force acting on it is constant and nonzero. c. There are no forces at all acting on it. d. There is only one force acting on it. c. The net force applied to the block is zero. If a block is moving to the left at a constant velocity, what can one conclude? a. There is exactly one force applied to the block. b. The net force applied to the block is directed to the left. d. There must be no forces at all applied to the block. d. It could be moving to the left, moving to the right, or be instantaneously at rest. A block of mass 2kg is acted upon by two forces: 3N (directed to the left) and 4N (directed to the right). What can you say about the block’s motion? a. It must be moving to the left. A massive block is being pulled along a horizontal frictionless surface by a constant horizontal force. The block must be __________. Two forces, of magnitude 4N and 10N10N, are applied to an object. The relative direction of the forces is unknown. The net force acting on the object __________. A book weighing 5 N rests on top of a table. An upward force of magnitude _____ is exerted on the _____ by the table. A book weighing 5 N rests on top of a table. Do the downward force (on the book by gravity) and upward force (on book by table) form a 3rd law pair? A book weighing 5 N rests on top of a table. The reaction to the force in Part A (on book by table) is a force of magnitude _____, exerted on the _____ by the _____. Its direction is _____ . A book weighing 5 N rests on top of a table. The reaction to the force in Part B (on book by table) is a force of magnitude _____, exerted on the _____ by the _____. Its direction is _____. Which body exerts the force that propels the sprinter, the blocks or the sprinter? (T/F) Every force has one and only one 3rd law pair force. (T/F) The two forces in each pair act in opposite directions. (T/F) The two forces in each pair can act on the same object or on different objects. (T/F) The two forces in each pair may have different physical origins (for instance, one of the forces could be due to gravity, and its pair force could be a normal contact force). (T/F) The two forces of a 3rd law pair always act on different objects. c. equal in magnitude to, and in the opposite direction from, the force on the earth due to the moon. a. greater in magnitude than, and in the opposite direction from, the force on the earth due to the moon. b. greater in magnitude than, and in the same direction as, the force on the earth due to the moon. d. equal in magnitude to, and in the same direction as, the force on the earth due to the moon. e. smaller in magnitude than, and in the opposite direction from, the force on the earth due to the moon. f. smaller in magnitude than, and in the same direction as, the force on the earth due to the moon. b. The magnitude of the normal force is equal to the magnitude of the weight of the suitcase minus the magnitude of the force of the pull. A man attempts to pick up his suitcase of weight ws by pulling straight up on the handle. However, he is unable to lift the suitcase from the floor. Which statement about the magnitude of the normal force n acting on the suitcase is true during the time that the man pulls upward on the suitcase? a. The magnitude of the normal force is equal to the magnitude of the weight of the suitcase. c. The magnitude of the normal force is equal to the sum of the magnitude of the force of the pull and the magnitude of the suitcase’s weight. d. The magnitude of the normal force is greater than the magnitude of the weight of the suitcase. c. The magnitude of the normal force is equal to the sum of the magnitude of the man’s weight and the magnitude of the suitcase’s weight. Now assume that the man of weight wm is tired and decides to sit on his suitcase. Which statement about the magnitude of the normal force n acting on the suitcase is true during the time that the man is sitting on the suitcase? a. The magnitude of the normal force is equal to the magnitude of the suitcase’s weight. b. The magnitude of the normal force is equal to the magnitude of the suitcase’s weight minus the magnitude of the man’s weight. d. The magnitude of the normal force is less than the magnitude of the suitcase’s weight. A large crate filled with physics laboratory equipment must be moved up an incline onto a truck. The crate is at rest on the incline. What can you say about the force of friction acting on the crate? c. The frictional force is zero. A physicist attempts to push the crate up the incline. The physicist senses that if he applies slightly more force the crate will move up the incline but cannot muster enough strength to get the motion started. What can you say now about the force of friction acting on the crate? The first physicist gets a second physicist to help. They both push on the crate, parallel to the surface of the incline, and it moves at constant speed up the incline. How does the force exerted by the two physicists on the crate compare with the force of friction on the crate? F of 2 physicists (is less than/equals/is greater than) F of friction. 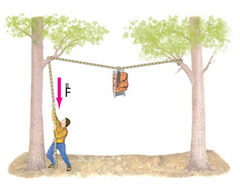 If the block is at rest (and the only forces acting on the block are the force due to gravity and the normal force from the table), what is the magnitude of the force due to friction? A truck is traveling horizontally to the right. When the truck starts to slow down, the crate on the (frictionless) truck bed starts to slide.In what direction could the net force be on the crate? You are trying to push your stalled car. Although you apply a horizontal force of 400N to the car, it doesn’t budge, and neither do you. What force(s) must also have a magnitude of 400N? d. The normal force exerted by the road on you. d. the ground exerts a greater friction force on Matt than it does on the truck. a. the truck offers no resistance because its brakes are off. b. he is heavier in some respects than the truck. c. he exerts a greater force on the truck than the truck exerts back on him. e. he is stronger than the truck. c. The force the water exerts on the paddle. What causes the boat to move forward? a. The force the paddle exerts on the water. b. The force the man exerts on the paddle. d. The motion of the water itself. b. The force of gravity acting on the ball. A golf ball is hit with a golf club. While the ball flies through the air, which forces act on the ball? a. The force of the golf club acting on the ball. c. The force of the ball moving forward through the air. d. continues at the velocity it had before the second force was applied. a. is brought to rest and then accelerates in the direction of the second force. b. decelerates gradually to rest. c. is brought to rest rapidly. c. the force you exert on the box is equal to the force of the box pushing back on you. a. you exert a force on the box, but the box does not exert a force on you. b. the force that the box exerts on you is greater than the force you exert on the box. d. the box is so heavy it exerts a force on you, but you do not exert a force on the box. A 50-N crate sits on a horizontal floor where the coefficient of static friction between the crate and the floor is 0.50 . A 20-N force is applied to the crate acting to the right. Since the elevator is not accelerating, the reading on the scale is the same as in the video. e. The speed and the acceleration of the cylinder have not changed. Imagine a small child whose legs are half as long as her parent’s legs. If her parent can walk at maximum speed V, at what maximum speed can the child walk? Imagine an astronaut who can walk on the earth at maximum speed V. At what maximum speed can the astronaut walk on the moon, where the acceleration due to gravity is one-sixth of that on the earth? A small car of mass m and a large car of mass 4m drive along a highway at constant speed. They approach a curve of radius R. Both cars maintain the same acceleration a as they travel around the curve. How does the speed of the small car v(s) compare to the speed of the large car v(L) as they round the curve? Now assume that two identical cars of mass m drive along a highway. One car approaches a curve of radius 2R at speed v. The second car approaches a curve of radius 6R at a speed of 3v. How does the magnitude F1 of the net force exerted on the first car compare to the magnitude F2 of the net force exerted on the second car? The closer together two masses are, the stronger is the gravitational attraction between them. Thus, the mass at the origin is more strongly attracted to the mass at x1 = -110 cm than it is to the mass at x2 = 450 cm . Thus, the net force on the mass at the origin is in the -x direction. Three identical very dense masses of 8000 kg each are placed on the x axis. One mass is at x1 = -110 cm , one is at the origin, and one is at x2 = 450 cm. What is the direction of the net gravitational force on the mass at the origin due to the other two masses? As the earth proceeds around its orbit of the sun, the direction of the gravitational force acting on it changes so that the force always points ____________. c. The earth exerts 3.53×1022N of force on the sun, exactly the same amount of force the sun exerts on the earth found in Part A.
Newton’s law of universal gravitation gives the magnitude of the gravitational force but does not distinguish between which object exerts the force and which object experiences the force. What is the size of the gravitational force acting on the sun due to the earth? a. The earth does not exert any gravitational force on the sun. b. The earth exerts some force on the sun, but less than 3.53×1022N because the earth, which is exerting the force, is so much less massive than the sun. d. The earth exerts more than 3.53×1022N of force on the sun because the sun, which is experiencing the force, is so much more massive than the earth. a. Reduce the mass of the earth to 1/4 its normal value. c. Reduce the mass of the earth to 1/2 its normal value and the sun to one half its normal value. d. Increase the separation between the earth and the sun to 4x its normal value. With the sun and the earth back in their regular positions, consider a space probe with mass mp=125kg launched from the earth toward the sun. When the probe is exactly halfway between the earth and the sun along the line connecting them, what is the direction of the net gravitational force acting on the probe? Ignore the effects of other massive objects in the solar system, such as the moon and other planets. b. The force is toward the earth. c. There is no net force because neither the sun nor the earth attracts the probe gravitationally at the midpoint. d. There is no net force because the gravitational attractions on the probe due to the sun and the earth are equal in size but point in opposite directions, so they cancel each other out. Which of the following quantities represent mass? Which of the following quantities would be acceptable representations of weight? The gravitational field on the surface of the earth is stronger than that on the surface of the moon. If a rock is transported from the moon to the earth, which properties of the rock change? An object is lifted from the surface of a spherical planet to an altitude equal to the radius of the planet. As a result, what happens to the mass and weight of the object? Two identical satellites orbit the earth in stable orbits. One satellite orbits with a speed v at a distance r from the center of the earth. The second satellite travels at a speed that is less than v. At what distance from the center of the earth does the second satellite orbit? Now assume that a satellite of mass m is orbiting the earth at a distance r from the center of the earth with speed ve. An identical satellite is orbiting the moon at the same distance with a speed vm. How does the time Tm it takes the satellite circling the moon to make one revolution compare to the time Te it takes the satellite orbiting the earth to make one revolution? While driving fast around a sharp right turn, you find yourself pressing against the car door. What is happening? Which of the following point towards the center of the circle in uniform circular motion? A Ping-Pong ball is shot into a circular tube that is lying flat (horizontal) on a table-top. When the Ping-Pong ball exits the tube, which path will it follow in the figure? d. Both the acceleration and net force on the car point inward. A car drives at steady speed around a perfectly circular track. a. The net force on the car is zero. b. Both the acceleration and net force on the car point outward. c. The car’s acceleration is zero. e. If there is no friction, the acceleration is outward. b. At the bottom of the circle. A child whirls a ball in a vertical circle. 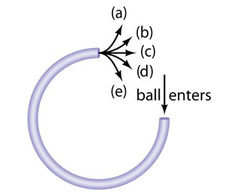 Assuming the speed of the ball is constant (an approximation) , when would the tension in the cord connected to the ball be greatest? a. A little after the bottom of the circle when the ball is climbing. c. Nowhere; the cord is stretched the same amount at all points. d. A little before the bottom of the circle when the ball is descending quickly. e. At the top of the circle. 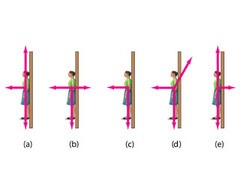 In a rotating vertical cylinder (Rotor-ride) a rider finds herself pressed with her back to the rotating wall. Which is the correct free-body diagram for her (see the figure). f. Both the same; the Moon. Which pulls harder gravitationally, the Earth on the Moon, or the Moon on the Earth? Which accelerates more? a. Both the same; the Earth. b. The Moon on the Earth; the Moon. c. The Earth on the Moon; the Moon. d. The Earth on the Moon; the Earth. e. The Moon on the Earth; the Earth. c. The two satellites have the same speed. Two satellites orbit the Earth in circular orbits of the same radius. One satellite is twice as massive as the other. Which statement is true about the speeds of these satellites? a. The lighter satellite moves twice as fast as the heavier one. b. The heavier satellite moves twice as fast as the lighter one. d. The ratio of their speeds depends on the orbital radius.